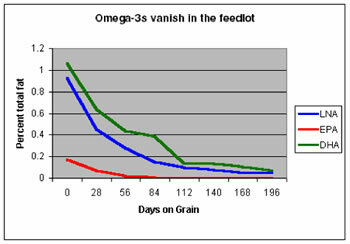 The difference between grainfed and grassfed animal products is dramatic. First of all, grass-fed products tend to be much lower in total fat than grain-fed products. For example, a sirloin steak from a grass-fed steer has about one half to one third the amount of fat as a similar cut from a grain-fed steer. 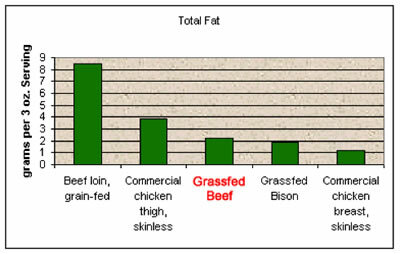 In fact, grassfed meat has about the same amount of fat as skinless chicken or wild deer1. When meat is this lean, it actually lowers your LDL cholesterol levels. If you eat a typical amount of beef (66.5 pounds a year), switching to grassfed beef will save you 17,733 calories a year—without requiring any willpower or change in eating habits. If everything else in your diet remains constant, you'll lose about six pounds a year. If all Americans switched to grassfed meat, our national epidemic of obesity would begin to diminish. In animal studies, these essential fatty acids have slowed the growth of a wide array of cancers and kept them from spreading.5 Although the human research is in its infancy, researchers have shown that omega-3s can slow or even reverse the extreme weight loss that accompanies advanced cancer. Animals are raised without added growth hormones. By Uruguayan law, cattle in Uruguay cannot be given any hormones - so you can rest assured that our beef is as healthy and safe as Nature intended. Our cattle is raised on native pastures and feeds on grasses and food found in a pasture, rather than being fattened on grain in a feedlot or barn. Pasturing livestock is a traditional farming technique that allows animals to be raised in a humane, ecologically sustainable manner.